There’s no denying it now, it’s full blown zucchini season! We harvested a couple hundred pounds this past week to bring to the farmers market and today we’ll be harvesting even more to include in this week’s CSA share. I know it’s easy to fall into a zucchini rut but this year I’m going to do my best to inspire all of our members (and my readers!!!) to have fun with this seasonal gem. Zucchini is so versatile that it can be included in everything from baked goods, to sauces, dips, and of course, made into noodles. In one of our first CSA newsletters to our members I encouraged folks to purchase a Spiralizer. They’re super affordable and are a great kitchen tool to have if you’re a part of a CSA or frequent the farmers market. They’ll make noodles out of just about anything; carrots, beets, cucumbers, parsnips, potatoes, you name it and this little gadget can do it! I like this Spiralizer from Amazon and highly recommend it. 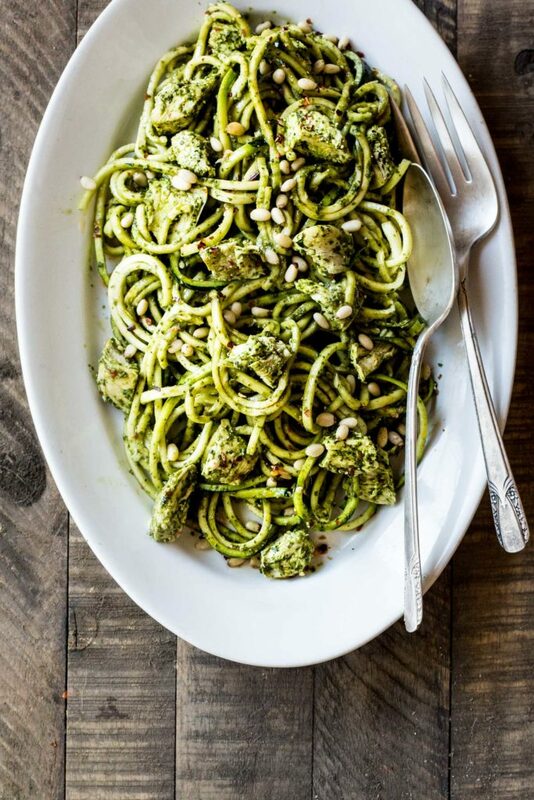 This simple meal of zucchini noodles and pesto is made complete with a little chicken and some toasted pine nuts for added flavor and protein. It’s a great recipe for hot summer evenings when it’s paired with a glass of rosé or your favorite summer wine. Prepare the pesto by combining the basil, nuts, garlic and salt in the bowl of a food processor. Process until finely chopped. With the motor running, slowing add the lemon juice and oil until the mixture is smooth and creamy. Taste and adjust seasonings as needed and add more oil if the pesto is too thick. Place the cut chicken breasts in a large bowl. Using your spiralzier make thin noodles with the zucchini. Add the noddles to the bowl with the chicken. Stir in half of the pesto and toss well until evenly coated, adding more pesto as needed. Divide between bowls and top with toasted pine nuts, parmesan cheese, salt, pepper and a sprinkle of crushed red pepper flakes. Pesto sounds delicious for a zucchini noodle dish! Always love this green substitution for those low-carb days! I have been on a major pesto kick and I love that this is a dairy free variation because I recently gave up cheese! Yum, I’ll need to try it. I’m always posting new recipes on my site ( http://www.behindtheplates.com ) but I am definitely lacking some more pesto recipes!! So you did not cook zuchinni noodles?